Continuing the water theme, we voyage with Mendelssohn by paddle-steamer to the Isle of Mull for The Hebrides Overture. In the best early Romantic tradition of nature painting, the composer evokes sonic images of rocking waves, the call of gulls, and echoes of human cries returning from the interior of the cave. Alan Hovhaness, a Somerville-born composer of Armenian heritage, composed And God Created Great Whales in 1970, making use of whale songs provided by Frank Watlington and Dr. Roger Payne. Among Dr. Payne’s students is Dr. Salvatore Cerchio, a Massachusetts resident who, in February 1990, made what has been described as the greatest recording of humpback whale song ever made. It is a recording of a single male—only the males sing since it is a courtship behavior—singing off the coast of Kaua’i, close to a steep shelf in the sea floor allowing for nearly ideal acoustical reflections. Hovhaness took Payne’s whale songs and presented them along with undulating instrumental textures and slow stately melodies. He used four separate segments of humpback song, played through an audio system over quietly improvised orchestral figures. For tonight’s performance, we have substituted excerpts from Dr. Cerchio’s recording for the original tracks used by Hovhaness. For the closer we turn to Debussy, a great many of whose works treat watery subjects. La Mer was also born of another of Debussy’s passions at the time, Emma Bardac. He dedicated his original score to her, making reference to dark times they shared as a result of pursuing an intimate relationship while both still married to other people: “For my little one whose eyes laugh in the shade.” Debussy’s turbulent state of mind must have had a profound effect on the music. Compared to the rest of his output, La Mer is unusual in its psychological depth and emotional power. BMInt: Compared to your programming, the “other” Esplanade Orchestra has dumbed-down the meaning of pops. Aside from the 1812 Overture, they play mostly commercial hits in rather un-idiomatic, un-swinging arrangements. The Landmarks Orchestra has a different understanding of what the public wants in the summer. CSW: Boston Landmarks Orchestra programs are not “pops” concerts, but they are popular. And the programming is eclectic. The emphasis is squarely on the first-rate professional orchestra that Landmarks is, so we do perform many of the “great works.” But we also commission a great deal of new music, which allows us to tailor-make repertoire best suited to our mission. We also perform other new and unusual works, especially those that have something to say about Boston, its history, or its culture. A typical Landmarks Orchestra season includes symphonic masterpieces performed alongside theatrical work, dances, folk songs, Latin jazz, and music influenced by cultures throughout the world. Your strategy, and this is savvy marketing as well as a principled outgrowth of your belief in outreach, is to involve schools, community groups, arts organizations. Landmarks programming is organized around a strategy of participation. We collaborate broadly. It is an exciting time for us right now. Major initiatives connecting us to our community have sprung up, some with significant national profile. Our long-term goal is to keep programming like this vibrant and sustainable. During the summer of 2015, a partial list of sponsors includes: New England Aquarium, Conservatory Lab Charter School, Inquilinos Boricuas en Acción, Longwood Symphony’ North End Music and Performing Arts Center, Back Bay Chorale, Honk! Festival of Activist Street Bands, ZUMIX, Camp Harbor View, Grooversity, Yawkey Club of Roxbury’ Boys and Girls Club of Dorchester, Commonwealth Shakespeare Company. Tell us about the orchestra. 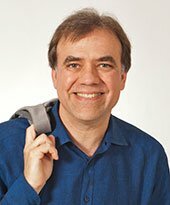 The orchestra was founded in 2001 by Charles Ansbacher to serve as a first-rate professional orchestra performing in Boston in the summertime. 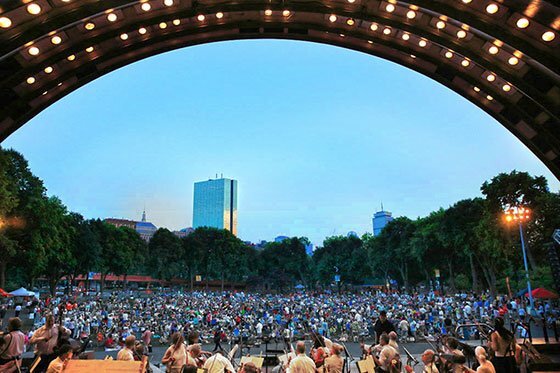 Since 2007, when the orchestra started giving concerts at the DCR’s Hatch Memorial Shell on the Esplanade, audiences have grown rapidly. We now host thousands along the banks of the Charles on a weekly basis. Our name comes from the close connection the orchestra has to Boston’s public spaces. We have performed on the Boston Common, in the Charlestown Navy Yard, and atop the bullpens in Fenway Park. We appear regularly in public parks, youth centers, and under-served neighborhoods throughout the city. We believe in the fun and spontaneity of music making, and consider all Bostonians to be our public. Every performance is designed to be as approachable as possible, with storylines and visual elements adding context and excitement to the experience. Nearly every week we collaborate with leading Boston-area artists and organizations. The residency of Berklee-trained, Brazilian-born pianist, vocalist and composer Clarice Assad is, is a good example. The daughter of a famous musician, Sergio Assad, one of the guitar-playing brothers of the Assad Duo, she will be here with favorite drummer and percussionist, Keita Ogawa, also Berklee-trained. Clarice’s residency is designed as large-scale multi-faceted collaboration. She and Keita will visit three youth programs: ZUMIX, a music and arts organization in East Boston with a student-driven curriculum; Camp Harbor View, a summer camp for urban youth on Long Island (one of Boston’s most historic Harbor Islands); and Grooversity, a Brazilian Samba and Drumming School affiliated with ZUMIX and Berklee. Clarice leads singing improvisation workshops she calls “VOXploration.” Participants make music in a group through imitation and experimentation. She directs the music making, helping the group become a coherent whole. Keita has developed a similar approach to working with percussionists. Their work with young musicians from our three collaborating organizations will be featured in all of Clarice’s public performances here, including in the work commissioned by the Landmarks Orchestra, Cirandadas (the name derives from a type of children’s folk song and dance in Brazil). At the conclusion of her first week of residency, on the afternoon of July 19th, Clarice, Keita, the Boston Landmarks Orchestra, and our young collaborators will appear in the Outside the Box festival on Boston Common. Outside the Box was inaugurated in 2013. We are pleased to be a part of it this year for the first time. Prior to our concert with Clarice, the orchestra will perform in Boston-based composer Matti Kovler’s children’s opera, Ami and Tami. Matti’s work is a reimagining of the Hansel and Gretel story. Clarice and Keita will return to Boston in August to perform as soloists on the Landmarks Orchestra’s series at the Hatch Shell on Wednesday, August 12 (with a rain date of August 13). The evening’s theme is story telling and folklore. Our young collaborators will no doubt be thrilled to perform with us on the Esplanade. Her first week here kicked off with a performance she gave together with an octet of Landmarks musicians at the Pinebank Promontory in Jamaica Plain on Sunday July 12. To close out her residency, Clarice and Keita will close at their rediency with a performance at the USS Constitution Museum in the Charlestown Navy Yard, again with members of the Landmarks Orchestra and their young partners. In recent years, the orchestra has become a leader in promoting accessibility and inclusiveness. The Breaking Down Barriers initiative—serving the blind, deaf, hard of hearing, and those limited in mobility—has earned the organization the UP Designation from the Massachusetts Cultural Council. The orchestra is one of only 11 organizations to have earned that distinction so far. Mother Nature was especially hard on Boston Landmarks Orchestra last season. Our opening concert was rained out completely, two more concerts were moved indoors, and our final concert was cut short when lightning approached the Hatch Shell. This season, the DCR has generously allowed us to hold some Thursday evenings as a rain date for our Wednesday night programs. We are also grateful to the Boston Musicians Association for allowing the of use rain dates. There are a couple of weeks when scheduling conflicts make the Thursday rain date plan impossible. These include opening night (July 15), and our program with Clarice Assad on August 12. The rain location for both of these events will be Emmanuel Church, 15 Newbury Street. The Longwood Symphony Orchestra has also chosen to use a rain location for their July 29 concert. That concert will be held at Church of the Covenant, 67 Newbury Street, if it should rain.